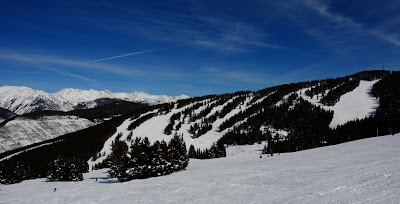 Vail, Colorado was founded in 1962 as a small mountain ski town. Nearly 50 years later it feels a bit like a European ski town theme park, but the mountain is still incredible. There wasn't any fresh snow, so I started getting as low as possible and practiced carving big ol' turns through the miles of corduroy.